Effective communication is key to success, and when you’re good at it, people notice. Most people think that strengthening communication skills involves developing persuasive speech and conversational skills. I believe the most powerful communication skills are not in your speaking, they’re in your listening! Communication is a 2-way process. There is a speaker and a listener. Without an effective listener, none of the conversational skills matter. If you want people to listen to you, you must listen to them first. Demonstrate a willingness to listen and understand and the rest of the communication process will flow with ease. 1. Fight the urge to speak. When you’re engaged in a conversation it’s natural to start concentrating on what you’re going to say next. You may even be tempted to open your mouth before the other person is finished. Make the extra effort to keep your lips sealed until he’s through talking. While he’s speaking, don’t worry about what you’re going to say next. Stay present and focus on the words and body language of the other person. 2. Look interested. Your nonverbal communication skills speak volumes! If you’re looking disinterested and uncaring, the person trying to communicate with you will pick up on these subtle hints. She may be flustered or less likely to share her thoughts. Engage with the person talking. Make eye contact and nod your head or smile. Let your conversation partner know that her points are coming across to you. 3. Paraphrase the highlights. Help your conversation partner know she is effectively communicating by restating her points. You can repeat key phrases in an affirming tone. Better yet, give her a quick summary of what she just said in your own words. Avoid sharing your opinions when paraphrasing concepts or ideas! At this point, you simply want to communicate that you’ve completely understood her meaning. 4. Ask questions. Don’t be afraid to ask your conversation partner to elaborate on what he’s saying. If you need further information, ask for it. The important thing is that you understand what he’s trying to get across. 5. Be patient. Effective listening skills take time to learn. I find the biggest hurdle to get over is your own discomfort of trying on this new skill. Trust your ability to take this on! And don’t be afraid to let people know you’re learning a new skill. Others will admire your willingness to learn and you’re openness about it. These door-openers may feel awkward at first, but give yourself permission to step into the discomfort. As you practice and learn to master effective listening, I guarantee your effectiveness as a leader will improve! Laura Watson, ACC, MSW is President of Venture Coaching Inc., and was a finalist for the Canadian Coach of the Year Award. Venture Coaching provides Business Coaching, and Life and Leadership coaching to entrepreneurs so they can love their life and business! Venture Coaching provides the tools, process and support to accelerate your personal and business growth. I adopted a great belief from my husband; “feedback is the breakfast of champions”. At first, I didn’t “get it”, but I have learned that receiving feedback is a powerful gift for personal and professional growth. I have also learned that giving feedback effectively is an important leadership skill that leads to powerful working relationships. I did not always share this perspective. For many years feedback (a.k.a. criticism) was something I dreaded and avoided. I didn’t want to hear it and I definitely didn’t want to give it. However, I am pleased to report that I have moved from being a feedback-avoider to recently being crowned the “Feedback Queen”. This is the first and most important consideration that makes or breaks effective feedback delivery. Often our decision to give feedback is triggered by feelings of anger, frustration, hurt or annoyance we feel towards another person. These feelings are triggered when someone does something and we judge or interpret the actions negatively. We make up a story about what the other person’s behavior means and we react to it with defensiveness, annoyance, anger or even sarcasm. Giving effective feedback relies on our ability to separate the other person’s actions (facts) from our story (judgment) of the facts. With this clarity, our own heated emotions usually dissipate and we are better prepared to give effective feedback. Give feedback any time someone says or does something that affects you, positively or negatively. Most of us avoid giving feedback and hate receiving it because it’s only offered when something negative happens. A great way to learn effective feedback delivery is to practice giving it during the good times! When your staff member says or does something that makes a difference in your day (i.e. takes initiative to send out some billings so you don’t have to), give feedback (according the steps listed below). Tell that person what a difference his actions made for you. Giving effective feedback is not about seeking agreement from another person, it’s about helping someone hear what we have to say without him defending himself, dismissing the information or making a counter-attack. Our emphasis is on understanding each other better. Remember, we all wander around the world, experiencing it from our own perspective. We forget that we all have different and unique ways of experiencing situations and events. Giving feedback helps others see better how their words and actions affect the people around them, which uncovers blind spots and helps them decide whether or not they want to change their behavior. No matter what your relationship is with the feedback recipient, sincerely ask if you may, “offer and idea”, “thank you for something” or “clear an issue”. Asking permission demonstrates respect for the other person and paves the way for their openness to hearing what you have to say. Why are you offering this feedback? Is your intention to strengthen the relationship? Do you need to get an issue off your chest? Do you want to help someone improve his performance? Being clear about our intention, and sharing this, increases our chances for success and continues to keep the recipient open to hearing it. Facts are words said and/or behaviors demonstrated (not our judgment of them). Spoken and written words that can be quoted are facts (i.e. when you said…..). Actions that could be videotaped are facts (i.e. when you sent the invoicing out without being asked). Facts not our judgements (i.e. when you were rude to me yesterday…). Describing the facts of the situation helps the recipient understand specifically and clearly what the feedback is referring to. By eliminating our judgment of the facts, emotion is removed and we reduce the likelihood of provoking defensiveness. Explain how the other person’s words or actions affected you or the story or judgment you made up about their behavior. It’s important to stay accountable, take ownership and use I-language (this will help decrease defensiveness and maintain receptivity in the listener). For example, we might say to a business partner, “when you told me the other day that you made this decision without talking to me, I felt disregarded. Making these kinds of decisions without me feels disrespectful and does not feel collaborative to me”. The recipient of this feedback might not like hearing it, but chances are he will be more open to hearing the message and willing to stay engaged to solve the problem. Are you ready to step up your leadership? Feedback is a tremendous gift we can learn to give others. Creativity, connection, collaboration, productivity, innovation, and problem solving all improve when companies give and seek out meaningful feedback. And these improvements foster accelerated progress in business and in life. I challenge you to become the Feedback Queen or King in your business! Clients often tell me they can’t get anything done because their email, phone calls and texting is pulling them away from their work. They feel constantly distracted, unproductive and at the mercy of their technology. What they forget is that they are in charge of technology, not the other way around! Failing to notice this and failing to take corrective action against these tendencies and behaviors, is interfering with your ability to perform. Recognizing you have a problem with overusing or chronically getting distracted by technology is the first step to solving the problem. It’s a dilemma most entrepreneurs face to some degree. If you think technology is taking charge of you instead of you being in charge of it, there are ways to successfully manage this. Click through to our linked article for 4 strategies for taking back control! Business owners are often very tough on themselves. They are driven to make their business succeed. They are also acutely aware of the risks at stake if they don’t. As they walk the line between feeling successful and fearing failure, they are often very critical of themselves. “We’re all our own worst critics” says Dr. Richard Davidson, and yet “self-criticism can take a toll on our minds and bodies”. Evolutionary psychologists have studied our natural “negativity bias,” which is the instinct in us all that makes negative experiences seem more significant than they really are. “It can lead to ruminative thoughts that interfere with our productivity, and it can impact our bodies by stimulating inflammatory mechanisms that lead to chronic illness and accelerate aging,” Davidson said. But that’s not all there is to the story. There are ways around our negativity bias, and it is possible to turn self-criticism into opportunities for learning and personal growth. In a previous post called “You are sabotaging your communication“, we talked about what NOT to do with your communication. I find it useful to help my clients build some awareness regarding how they may be ineffectively communicating and negatively impacting their relationships, so they are inspired to learn some new skills. Today we’re talking about what to do to make your leadership communication more effective. In an age of email and texting, listening skills have become a lost art. One of the best compliments I get from my clients is that I’m a great listener. I think it’s a powerful gift to really listen to someone and give them an experience of being heard. When people feel heard, they feel understood. When they feel understood, strong relationships are formed. In this video you will learn 3 types of listening skills and you will learn how to create clarity in your communication. We’ll also discuss some problem-solving skills so you can start to facilitate and coach your staff rather then being a constant problem-solver for them. Enjoy! Lead To Succeed: The Lost Art Of Listening from Venture Coaching on Vimeo. The top 10% of large companies surveyed experience real and material benefits from their planning processes – far beyond those of average companies. They’re enjoying improved control over costs, increased foresight, improved operational performance, increased transparency and insight into the business, a sense of shared purpose, and increased profit. I work with business owners all the time who don’t have plan. If they do have a plan, they are usually not executing on it because they have not created actions steps and/or they are “too busy”. Yet research tells us that successful companies have and follow a plan. I help business owners write simple plans they can execute! Because the planning is simple and action steps are included and scheduled in a calendar, execution rates increase dramatically and so does business success! Today I want to share the business planning and execution process my clients find so beneficial. Enjoy! Lead To Succeed: Being Effective – Plan, Calendar, Execute! from Venture Coaching on Vimeo. Now it’s time to get to work on your plan and follow through! I would love to hear about your discoveries, so please comment on this post to share your experience. One of last week’s coaching sessions focused on the important and common issue of self sabotage. I started a coaching session with a client by asking Bill (not his real name) how he was doing. He said, “fine” with a tone that told me otherwise. When I challenged Bill he responded, “you’re right, I’m frustrated, irritable and having bouts of uncontrollable rage”. Then, with a chuckle, he tried to make light of his coping strategies of “driving like a maniac (140 km.hr) to meetings” and his plan to drink 40 oz of whiskey on the weekend (instead of his usual 26 oz). It was clear. Bill was stuck in a downward spiral of self-sabotage that was putting him, his business and others at risk. He needed to switch out of his destructive pattern and back into his constructive patterns again. Bill even knew he was in a downward spiral, he felt out of control and he didn’t know how to switch back again. How many times has this been you? How much time, energy and money have you wasted being stuck? How many relationships or partnerships have you damaged? How many times have you realized you’re in a downward spiral and you don’t know how to get out? Getting unstuck is a skill we can learn like any other. First we need to recognize the pattern, know what to do when it happens and then apply the skill. And, just like learning yoga or golf, it’s easier and more effective the more we practice. In order to help Bill get “unstuck”, I introduced him to the “switching model”. Everything starts with an EVENT. 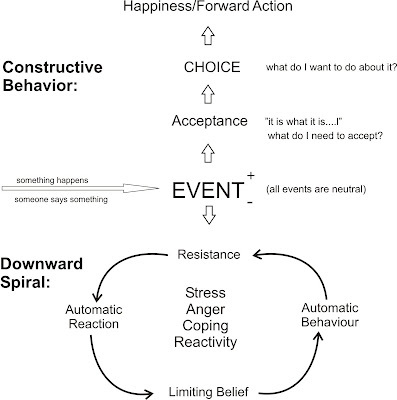 The downward spiral is triggered when we resist the event. Our resistance leads to an automatic negative emotional reaction. This reaction is based on some limiting beliefs we hold (whether or not we are conscious of them). We react with some automatic behavior (ie. defensiveness, anger, confrontation, drinking) that leave us feeling worse. The downward spiral has begun. We feel stressed, irritable and out of control. This downward spiral is our self-sabotaging pattern in action. This spiral typically keeps spinning and we can sabotage our selves for days, weeks and months. 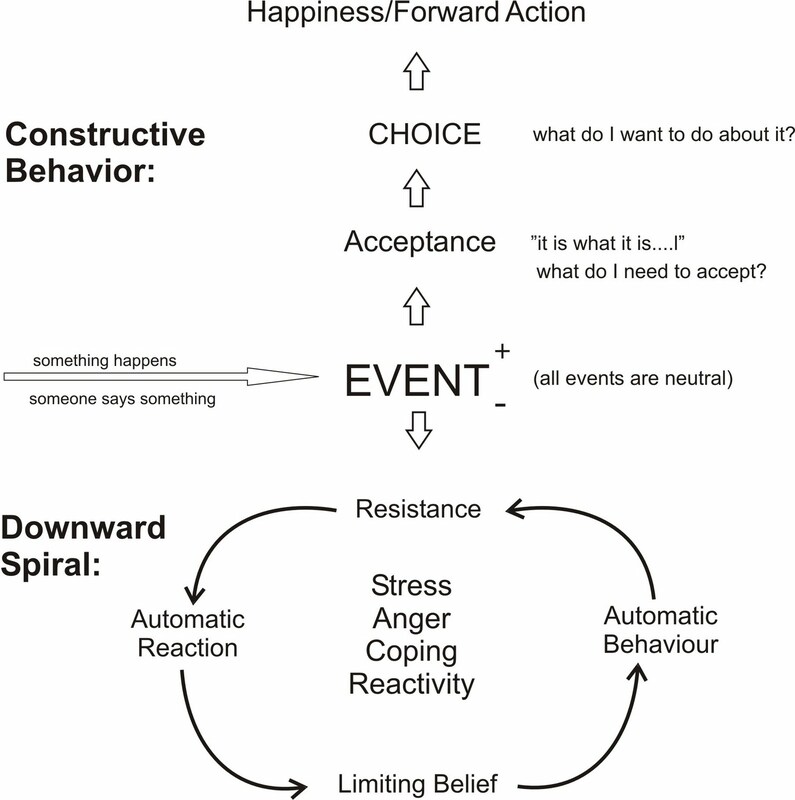 This spiral keeps looping around and down until the negative feelings eventually dissipate over time. Meanwhile, we feel miserable, we lose sleep, we over eat, we over-react to people (damaging relationships) and we often use vices as coping mechanisms. A lot of time, money and energy is wasted while reinforcing the limiting beliefs that started the cycle in the first place. Getting unstuck requires us to return to the event. The key now is to see the event merely as words or actions with no meaning attached (ie. not our judgement or the meaning we assumed). When we do this, we can see the event as being neutral. We can accept the event for merely being an event, with no meaning attached and we can initiate our constructive behavior patterns again. It’s important to remember that we may not always be able to control the events around us, but we can always choose how we respond to them. Once we shift ourselves back into a positive place of choice, we feel in control, confident and calm. We resume being productive and constructive. Once Bill reframed his interpretation of the events upsetting him, he reaped the benefits immediately. His rage and frustration dissipated, his creativity opened up and we created a plan together for how he would approach an important meeting that afternoon. In a follow up call, Bill felt excited for hosting a successful meeting, he had not received any speeding tickets and he enjoyed his weekend with his family. We all have an amazing ability to choose how we view events around us and choose how we let them affect us, destructively or constructively. A key role of a professional coach is to help people develop mastery over the ability to apply choice. When we apply the power of choice, the average destructive to constructive cycle-time shifts from days to minutes or even moments. Less time, energy and money is wasted and the positive impact can be huge! Laura Watson, ACC, MSW is President of Venture Coaching Inc., and was a finalist for the 2010 Canadian Coach of the Year Award. Venture Coaching provides leadership and business coaching programs to entrepreneurs so they can love their life and business! Venture Coaching provides the tools, processes and support to accelerate your business and personal growth.